American Avocet In Our Midst! 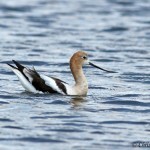 The American Avocet made a rare appearance in the Meadowlands yesterday. The wader usually doesn’t journey to New Jersey often, and when it does, the Avocet primarily stops in the southern portion of the State. Michael Britt first spotted this great looking bird Saturday in the Hudson County section of the Saw Mill Mudflats. It eventually flew to the Marsh Discovery Trail in DeKorte Park, where numerous birders reported it in the neighborhood of the Common Gallinule. 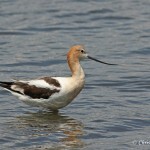 In the afternoon the Avocet could be seen from the Transco Trail by the boat launch and the weather station. Chris Takacs’ photos are taken from the boat launch.